Looking for an easy way to watch the performance numbers of your BMW E46 325I 330I climb? It really is a simple solution! Swap the E46’s factory header with integrated cats, known to be highly restrictive, for a BMW E46 performance header that is much more free-flowing. There are a few problems when it comes to the factory manifolds of the E46 325I 330I, which are the reason owners aren’t releasing the full potential of their BMW. For one, the exhaust catalysts are situated right against the cylinder head – which cause an extreme amount of heat to build up. Also, cylinders one through three, and four through six, are each channeled through a single pipe, greatly restricting the air flow. These characteristics are responsible for the production of more heat, due to an inherently bottleneck system, which effects the overall performance and power of the car. 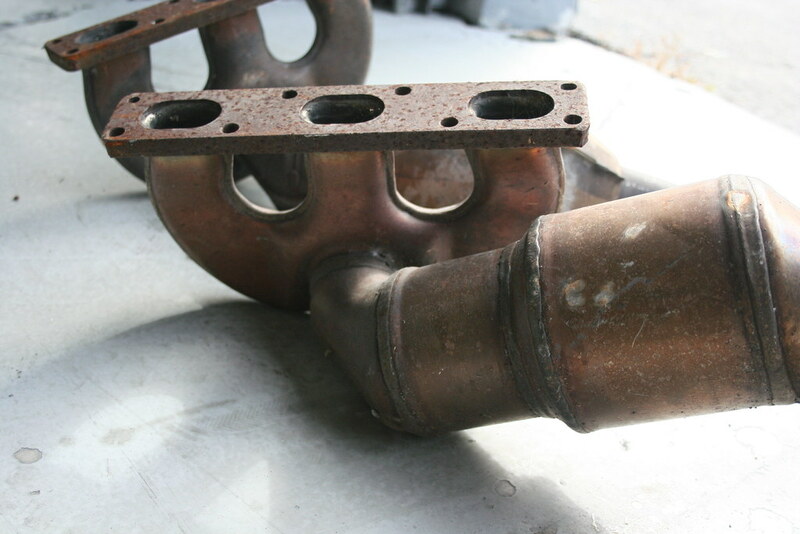 To address the problems with the factory manifolds without compromising durability, the stock exhaust catalysts are removed when the Active Autowerke 3-series sports header is installed. 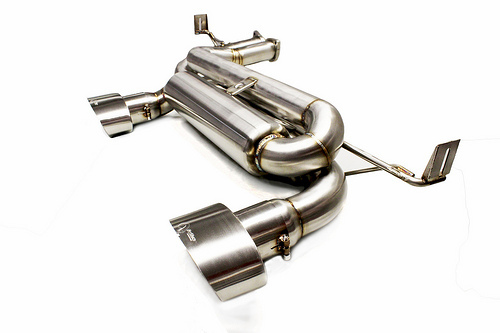 Our E46 performance headers are constructed completely from 100% polished 304 stainless steel and the gains produced have been dyno-tested. Be sure to check out our E46 BMW rear exhaust for even more horsepower! While an increase in speed is the main draw for installing our E46 3-series performance header, the added horsepower isn’t the only benefits. Our performance headers are heard to ignore because they were designed to add a lot more style and a unique look to your ride! Being part of the BOSCH Service network, Active Autowerke is pleased to have available financing from Credit First National Association for those unassuming repairs. Active Autowerke is pleased to have PES on board as part of our participating dealer program. So if you reside in Weat Ridge or the suburbs of Denver make sure to visit PES and see Kenny or Ernie at 303-421-0365. Congrats to Paul Azan on clenching 1st Place for the SARRC Southeast Regional Championship with his BMW E46 powered by Active Autowerke. After 35 years, the exterior paint has taken it tool on the building. It is time for a much needed face-lift. The interior is also getting some attention as well. Sometime back, the staff at Grassroots Magazine came to Active Autowerke with a BMW 235i in quest of making more power. With the 235i strapped on the dyno, this BMW measured 292 wheel horsepower in stock form. With the flip of By Pass Plug, this BMW 235i got 346 wheel horsepower with just the Active 8 Piggy Back installed. That's 54 ++ more HP at the rear wheels with a simple DIY bolt on. Read the full article in the December 2015 issue. 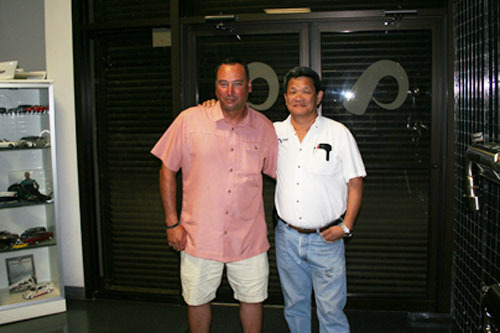 Welcome M Technik of San Antonio, Texas to the Active Autowerke family of dealers. So for those residing within San Antonio, here is another facility to help take care of your BMW. Call 210-320-18820 and speak to Laz. Here is a F8x M4 that is being tested on our Mustang dyno. We wanted to see how our exhaust system compares against the BMW factory unit. For a technical breakdown, follow the thread at f80.bimmerpost.com. We wanted to show that our system performs just as good as it sounds! Always a great day whenever an Active Autowerke distributor stops by for a visit. Here is Active Sales Associate Viral Vahia with Ricardo Grecco from Mecanica Mandala, Sao Paulo, Brazil along with Michael Hugh, of Active Autowerke. Learn more about Ricardo, his BMW services offered and what BMW performance parts are available for you in Brazil. CLICK HERE to visit his website. New arsenal for the Active Autowerke performance software. With the new Simon3, you can perform the task of uploading your BMW tuned file yourself. You just need a laptop to help with the interface. Multiple features with a lower cost helps to make the Simon3 attractive. Savings are even greater when bundled with the proven Active Autowerke system. BMW M4 owner, Colby Cote, recently had the Active Autowerke ACTIVE-8 performance module installed by The M Shop, an Active dealer in the Los Angeles , California area.. Here is Colby's impression: "...The tune is amazing, it really turned the car into a whole other beast. The difference is so notable that 2nd gear feels like what was first gear with additional torque and power. Active Autowerke welcomes WORKS Engineering to our family of dealers that can now offer to the BMW enthusiast Active Autowerke Performance software. So if you live around Sonoma, California, stop by and visit their facility and speak to Peter Kang at (415) 226-2500 about modding your BMW today. 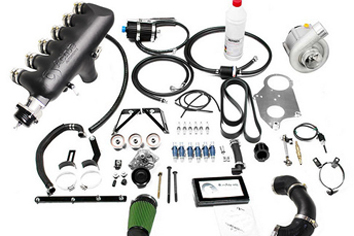 The Active Autowerke supercharger system for the BMW E46 M3 just got a new upgrade. With the relentless pursuit for more, the BMW E46 M3 SC system had to change to a larger, more efficient fuel injector. As a result, other components were also reconfigure although not as obvious. In the transformation came a matched tune and a reconfiguration of the DME algorithms all tweaked for more. 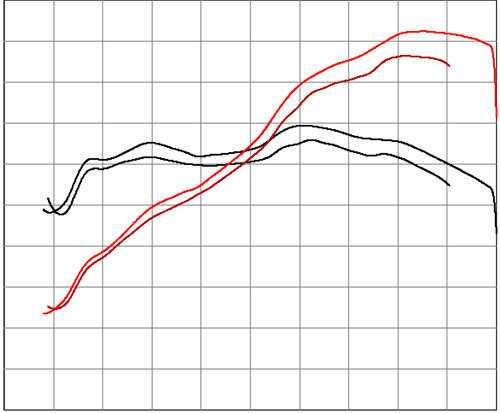 Results are better warm starts, with a crisper and a more responsive throttle. This is the new Generation 9 that is now applicable on all PRIMA, PRIMA PLUS, LEVEL 1, and LEVEL 2. Learn MORE. Remember to make it your day. 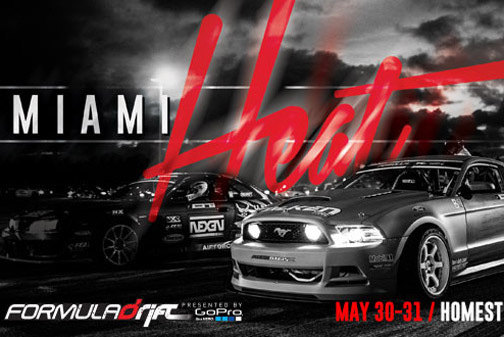 This Saturday, April 25, 2015 at Miami Homestead Speedway is the day for all South Florida BMWs to just hang out, strut your stuff or even test your ride on the portable Dyno. 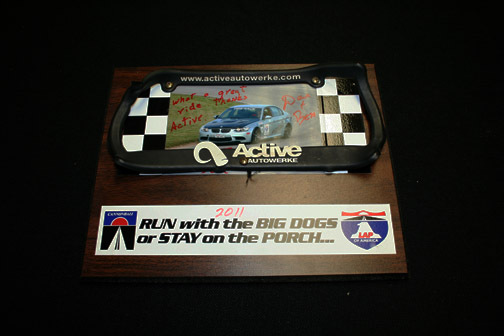 Stop by the Active Autowerke booth and see what we have for your BMW. Active Autowerke is proud to welcome Autovation, our representative for all your BMW performance parts by Active Autowerke in the Stittsville, Ontario, Canada area. So if you need an Active Autowerke software tune, Autovation can do this for you usually within the same day at their facility. and speak to Derek Lamoureux at (613) 831-8714 and check out their facility. Active Autowerke is proud to welcome Harrison Motorsports, our representative for all your BMW performance parts by Active Autowerke in Alpharetta, Georgia. So if you need an Active Autowerke software tune, Harrison Motorsports can do this for you usually within the same day at their facility. Do you have anything doing Saturday, April 18, 2015 or Sunday, April 18, 2015? How about a few days of racing at he Homestead Motorsport complex. If you reside in sunny Dade county, Miami, Florida, then stop by Active Autowerke and receive a courtesy admission ticket to the races. So mark the date and plan for a great week-end. Active Autowerke is proud to welcome RESS Motorworks, our representative for all your BMW performance parts by Active Autowerke in Indianapolis, Indiana. So if you need an Active Autowerke software tune, RESS Motorworks can do this for you usually within the same day at their facility. Visit AutoEvolve on-line and read the article featuring BMW tuner, Active Autowerke on the new BMW software platform for the BMW F8x M4 | M3. with the ACTIVE 8 performance module. Easy to use and install in just a few minutes with an obscure engine bay presence. It's as almost as if nothing was there to detect. CLICK HERE to read the article. Active Autowerke introduces a BMW performance software module that will dramatically increase the horsepower gains on the new F series model BMWs. Models such as the F10 M5 or the F8 M4s. Active Autowerke is proud to welcome RENNSPORT Imports, our representative for all your BMW performance parts by Active Autowerke in Moscow, RUSSIA. So if you need an Active Autowerke software tune, RENNSPORT Imports can do this for you usually within the same day at their facility. Here is a link to RENNSPORT Imports. 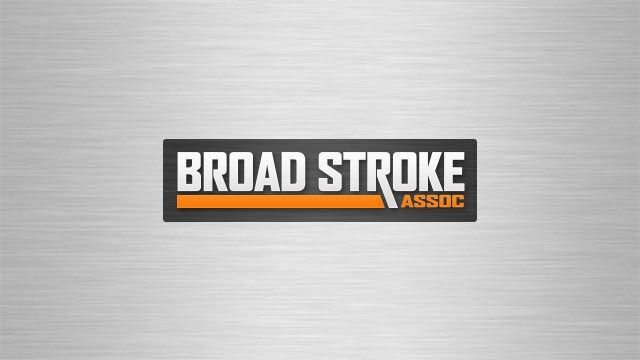 Active Autowerke is proud to welcome Broad Stroke Associates (BSA), our representative for all your BMW performance parts by Active Autowerke in the Snohomish, Washington area. Broad Stroke Associates (BSA) is an independent BMW and MINI facility providing full service and care to all BMW and MINI in the Snohomish, Washington state area. So if you need an Active Autowerke software tune, Broad Stroke Associates can do this for you usually within the same day at their facility. Here is a link to Broad Stroke Associates. Make sure to watch the video. and speak to Parker Davis at (866) 810-3469 and check out their facility. FAO staff at Active Autowerke. Hope you like it. I think it looks great behind the BMW Performance front bumper. Thanks guys! Stephen, I would like to give you any Active Autowerke T-Shirt of your choice, just visit the Active Apparel webpage and make a selection. Send to me your size, choice and color and I will gladly ship out to you, even if you are located in the UK. If you follow SCCA racing, we are down to the MAJORS with only a few more races remaining before the finale at Daytona; but before we get there, we have to contend with the next upcoming venue which is at Sebring International raceway located in Florida. Here is Mark Forbes making his final look over before this week-end. What better way to spend this upcoming week-end. You can then root for Mark and this BMW at Sebring International raceway. Active Autowerke is proud to welcome Modified by KC, our representative for all your BMW performance parts by Active Autowerke in the Kansas City, Kansas area. Modified by KC currently is the only facility in the Kansas City area that has an AWD dyno. 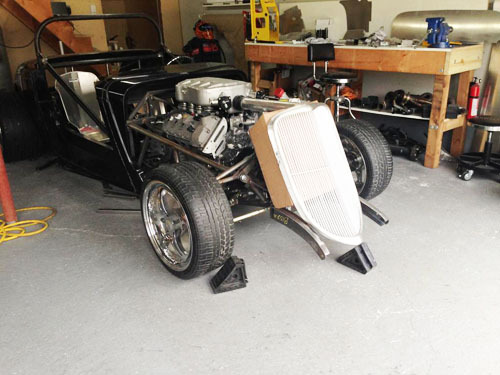 They are also a full fabrication facility that can completely transform your street machine into a race project. From simple catch cans to custom full cages… Modified by KC can handle your performance dreams. and speak to either Ryan or Chad at (913) 432-8468 and check out their facility. and check out the facility. MORE POWER for BMW E9x 328i. With the on going pursuit to gain MORE..MORE..POWER.. in BMW PERFORMANCE. Active Autowerke is excited to show what a normally aspired BMW E9x 328i with the N52 motor can really produce. The results are all measured at the rear wheels, where it really counts when putting it down to the pavement. Special thanks goes out to Dan Connor at Bimmer Performance Center in Raleigh, North Carolina for all the work in BETA Testing a 2010 BMW 128i with the N52 motor. We got almost 250 Rear Wheel Horsepower on his DynoJet, this measures out to be almost 40 Horsepower MORE over the stock on the same DynoJET. We like the saying "...Come Play With Power..." now you can too. GREAT deals and BIG savings. DOUBLE SELECTION. Own a BMW E82 135i, Active Autowerke have your covered for the choices in exhaust systems. Straight through design with the NOISE CANCELLATION CHAMBER NCC on the GEN 1 version or a contemporary design featuring a hi-flow exhaust resonator, which is featured on the new GEN 2. LEARN MORE here about the GEN2 exhaust. BIG SAVINGS. With R&D costs now amortized and product development completed. Active Autwerke is bringing to the table a powerful BMW CSL style header that consistently makes power. This is the same style header that was used by Robert Chang to propel his race prepped BMW E46 M3 in claiming the 2013 BMWCCA National Championship. With equal length tubular runners and a precise fitment, this new designated GEN 2 header can be distinguished by the stainless steel exterior sporting a BRUSHED FINISH. Once costing $1,350.00, this header is now available for only $799.00. LEARN MORE on how to obtain one of these headers for yourself. BMW E9x M3 with the Active Autowerke 700 horsepower dominates the competition. READ more here with write up, multiple videos and a list of the contenders. SIMPLE. We want your hard earned money, that we made this the absolute best place to buy all your Active Autowerke BMW performance parts. Own a BMW E46 M3 with headers and experiencing obnoxious un-burnt fuel smells and the annoying RASP like nose that is inherent in all BMW E46 M3. Then look what Active Autowerke now has available just for you. Learn MORE. See a White E9x M3 powered by the Active Autowerke 700 HP supercharger running against a few other BMWs like a F82 M4 with some mods. From a rolling start, see how "Come Play with POWER" has it's rewards. Kudos goes to out to Jimmy Silva, owner of this white E9x M3 SC and the guys at Auto Talent for all of their support and hard work. 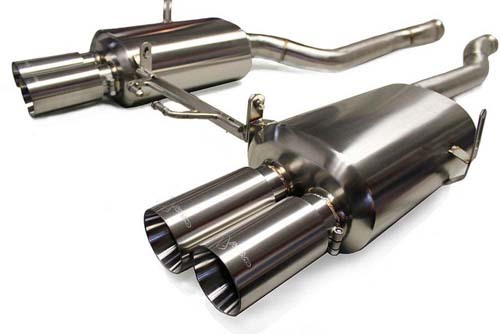 NEW exhaust for the BMW F30 335i and BMW F32 435i featuring Compact design, fantastic sound and great value. Learn MORE here. Here is a beautifully done BMW E9x M3 with a GTRS3 Wide Body Kit as shown in Las Vegas SEMA show 2014. Named the ** Red Dragon ** and owned by Edison Hwang, this BMW M3 is powered by the Active Autowerke 700 Horsepower supercharger. BMW power, BMW performance are some of the essential elements to this Active BMW. Want to Learn MORE on how to add 700 horses to your own BMW E9x M3? CLICK HERE. Welcome Reggie's Motorworks, Inc. the latest Active Autowerke Software Flashing dealer in the Noblesville, Indiana area for all of your Active Autowerke tuning and BMW performance parts. Just give Reggie a call at 317-773-0074 to schedule an appointment or stop by and check out the facility. Remember, Reggie's Motorworks is also a BOSCH Service Center. Being a member of the BOSH Service network says a lot about Reggie's Motorworks and their company standing. Here is the latest on what's NEW in BMW performance parts for your BMW E9x 328i 2006-2011. 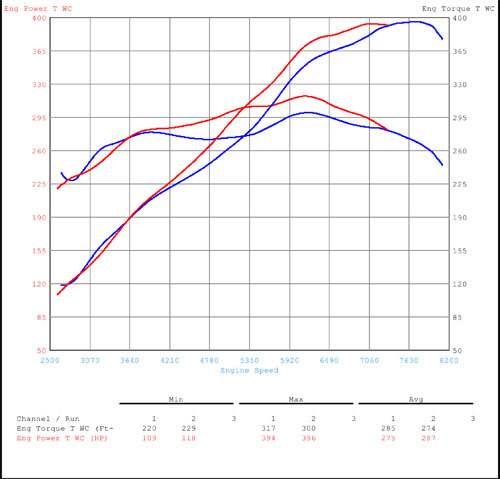 How about a 20+ rear wheel horsepower gain measure on our very own chassis dyno. See the dyno graph. A introductory pricing package was created that includes $100.00 OFF the MSRP price and gives FREE shipping within the continental USA, Learn More Here. Or just contact Andrew Fish, Active Autowerke Sales Associate @ 305-233-9300 x 227 or e-mail Afish@activeautowerke.com for more details. This is a special deal for the first 20 buyers ONLY and is only available on the E90 POST forum. These headers will be delivered to them before December 25, 2014. With all the buzz about the new PRIMA Supercharger kit for the BMW E46 M3 making 480 engine horses and the installation being all inclusive. Joe Barrios, the owner of The M Shop in Los Angeles, California thought the deal was not only fantastic, but super unreal. He bought 2 of these PRIMA SC kits for customers "... on the fence..." waiting for such a super deal. So if you are in the Los Angeles, CA area and would like to see, hear and feel one of these PRIMA SC kits, then call Joe or Jon at (323) 257-5773. 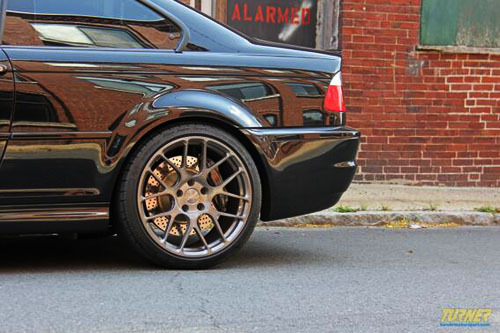 You will be pleasantly surprised as to how 480 horses can transform the BMW E46 M3 to another BMW performance level. At Active Autowerke, we like the phrase "...Come Play with POWER..."
What possibilities can you do with 600 HORSEPOWER on a BMW E46 M3? Not satisfied with just 480 HP on your existing BMW E46 M3 PRIMA supercharger. How about making 600 HP instead? Then take a look at the PRIMA PLUS + Upgrade KIT. This UPGRADE KIT works flawlessly with the Active Autowerke PRIMA SC and instantly transform 6.0 psi to 9.50 psi with just a flip of a switch. The best deal ever if you own a BMW E46 M3 and in the market looking for some serious horsepower. How about 480+ horsepower at a incredible price to include the installation, freight and much more. All combined in an incredible ALL INCLUSIVE DEAL. Sometimes the best thing comes in a small package. If you need to install an oil pressure gauge in your BMW, you will need this to make everything OK. The ODB-KIT makes the final connection to the engine oil artery seamless and easy. Here are some findings on the Active Autowerke E46 M3 SC with the PRIMA + and various other BETA setups. Kudos to the guys at Tuning Tech FS for their diligence in helping massage the power gains from this unbelievable SC set-up. The Prima Dynojet results showed 426 WHP on 5.8 psi of boost. Amazing but more to come. Going to the upgraded Prima Plus kit with methanol injection and 9.0 psi of boost raise the output to 514 WHP on a Dynojet. Unbelievable. Active is adding a Prima Elite supercharger kit to the range. The pricing and details are not yet finalized but Tuning Tech FS is already tuning the setup. The Prima Elite and Prima Plus both run 9 psi of boost but the Prima Elite is running E85 fuel instead of 93 octane and meth. The Prima Elite on E85 manages another 31.7 peak wheel horsepower over the Prima Plus with torque gains through the curve. For the BMW E46 M3 SC running on WA/Meth, here is something different. Individual direct port injection for your methanol. Custom fabrication with re-sized meth nozzles ending into a custom Meth housing. Only some lines visible for a super clean install. Better atomization to each individual cylinder, and precise fluid delivery for that optimum performance. If interested, speak to an Active Autowerke sales personnel on how to have your Active Autowerke E46 M3 SC intake redone. BMW E92 M3 normally aspirated being tuned on the Active Autowerke in house dyno. Running on RON 93 octane and equipped with open exhaust, larger headers and a drop in air filter, this BMW E92 M3 showed some good horsepower figures considering the high parasitic nature of the Mustang Dyno. 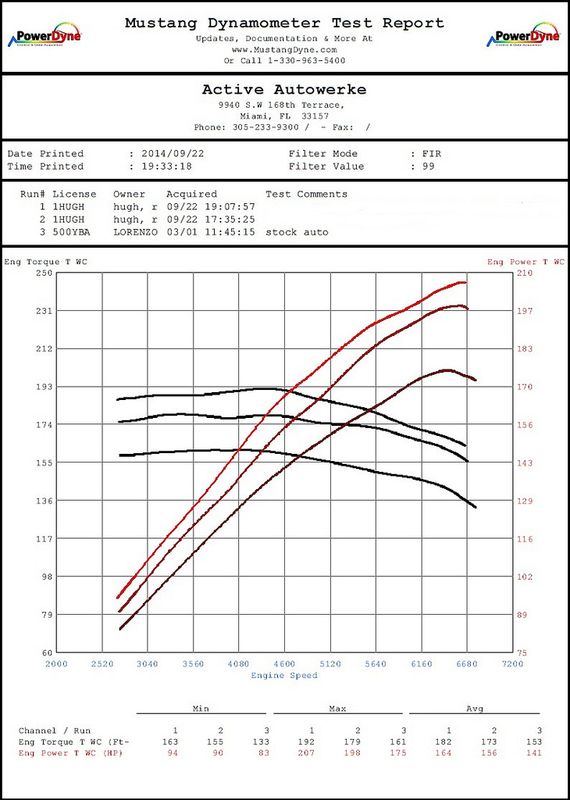 Measured 402 WHP vs. 329 WHP of a bone stock E92 M3 on the same dyno. That's a 73+ WHP gain. Do the math counting the drive line loss to recalculate the ponies at the engine crankshaft. That's some serious horsepower either way you look at it. Old friends reuniting. Here is Frank Smith from Tuning Tech,FS and Karl Hugh, Head of Engineering, Active Autowerke. Did you know that Frank used to live in Miami, Florida and he had a shop not too far from Active Autowerke. Did you know that Karl has known Frank for over twenty years. It was a good day when old friends can reunite and talk. Talk about PRIMA, tuning, files and codes. What else would BMW tuners talk about? Follow Turner Motorsports on their Twitter feed and read all about this BMW E46 M3 stroker build. Active Autowerke is proud to be associated with partners like TMS, Forgeline wheels, Stop Tech brakes, Bilstein suspension, and P3 Cars. This is one of the many engine builds with software tuning that Active Autowerke has partnered with TMS on creating for the BMW community. Development continues on our Prima+ Kit. If you reside in the Maryland area, check out Alex Gogne and his beautiful E46 M3. What's on the inside is most impressive. With the Active Autowerke PRIMA supercharger installed and featuring a stepped exhaust header V2 design; 100 cell hi-f;ow catalysts; a X-PIPE; and a RACE exhaust system as performance mods, Alex is able to put down 426 horsepower at the rear wheels on a Dynojet under 5.8 psi of boost. As a beta-tester for the upcoming PRIMA+ featuring 9.0 psi of boost with Water/Methanol added, Alex M3 was able to record 514.20 horsepower on the same Dynojet. Working along with Tuning Tech,FS has been instrumental in acquiring results like this. The net effect is what the PRIMA and easily upgrade PRIMA+ can do. Either way, the options for further upgrades like intercooling and a upgraded fuel system makes the BMW E46 M3 the most desirable performance platform available today. Factory horsepower for the BMW E46 M3 is rated 333 engine horsepower at the crankshaft. What possibilities could you create with 480+ engine horsepower from a bolt on system, That is almost a 50% gain over factory. Better yet, the pricing is unbelievable.Click here for more information. It all started in 2011 when Dr. Dan Schaut installed an Active Autowerke supercharger to propel his V8 E9x M3 for the OLOA race across America. Since then and for a fourth time, Dan Schaut with his son Ben Schaut has place the silver E9x M3 as the best finishing BMW. This year they won their class, and came tenth overall as well. Click here for the 2014 OLOA race results. With a stock engine and a off-the-shelf supercharger kit, we just wanted to say Thank You and kudos to another terrific accomplishment from everyone here at Active Autowerke. 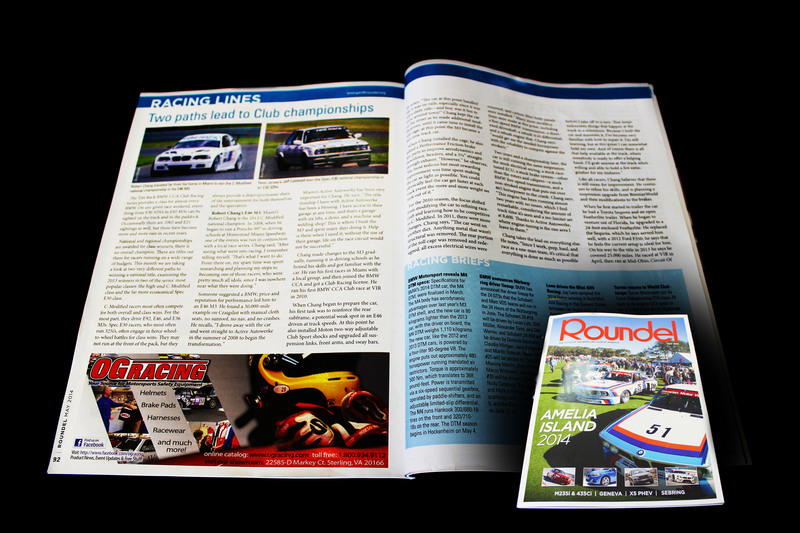 Check out the New issue of Roundel Magazine. B Morgan interviews Robert Chang, 2013 BMWCCA National Champion who shares his BMW racing path to victory all within 3 years. Maybe you can do this too. Click here to take a peek. 500 horspower is what the E60 M5 V10 has. The BMW E36 M3 Euro S50B32 powered with the Active Autowerke HKS supercharger not only matches the V10 on TOP with the pony numbers, but will annihilate the M5 from 4200 rpms all the way to 7200 rpms. Click here for more information. Now you can feel really special if you own a BMW E60 M5 or a BMW E63 M6... Active Autowerke released a software utilizing Alpha N technology to deliver an additional 30 more horses at the rear wheels as measured on the Mustang Dyno. Easy Horsepower GAINS for your BMW E9x M3 V8. Cool and easy makes for a great week-end project, but is only intended for OFF-ROAD applications like the race track. Click here for more information. Simply amazing. Install the Active Data Logger and see how your engine reacts on all cylinders to your present or performance tuned software. 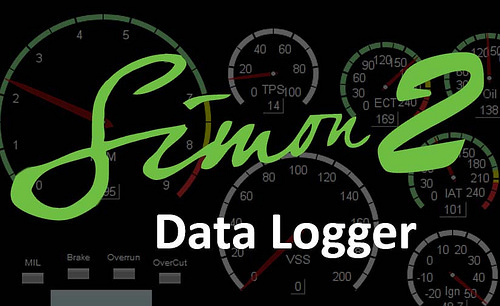 Click here for more information regarding the Active Data Logger for your software. Click here for more information regarding the Supercharger system. Introducing the latest addition to the Active Autowerke BMW Exhaust line. 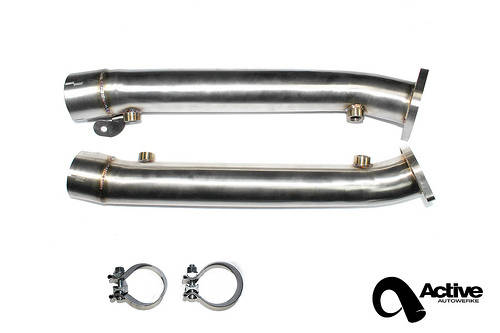 A E46 M3 Rear Track exhaust that weighs only 23 lbs.Click here for more details. 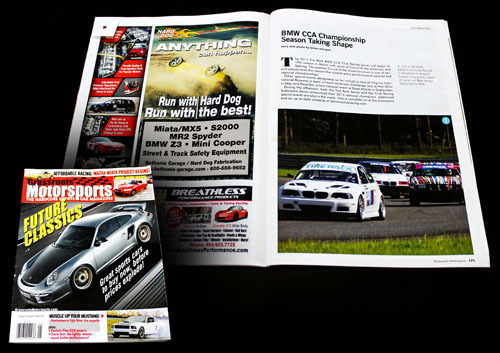 Do you have the May issue of Grassroots Motorsports yet? Turn to page 171 to see this familiar car blazing ahead of the competition. That's right. Robert Chang, last year's Champion in his class, is back. Contenders beware. Are you in VA? Then stop by the VIR track this Sunday and say hello to Robert Chang. 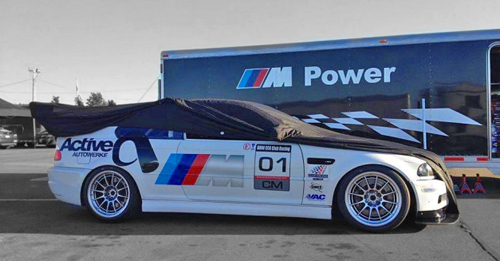 You can also root for him as he powers the E46 M3 this weekend to defend the BMWCCA 2014 Championship. In other news, Robert Chang won again this past weekend in Austin, Texas! This is his first race for 2014. We'll keep you posted as our champion continues to dominate his class.